Field Repairable – Reusable anodized aircraft aluminum fittings. 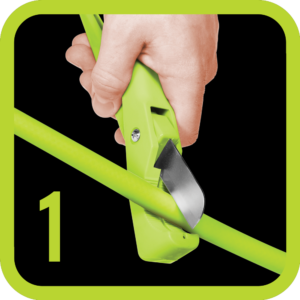 CUT – Measure and cut desired length of hose at 90° angle. 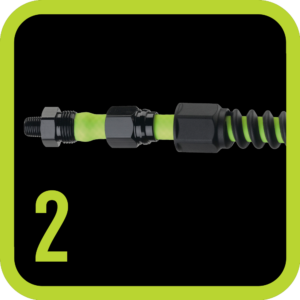 INSTALL – Slide spiral fitting and nut onto hose. Push hose onto fitting until hose reaches threads. 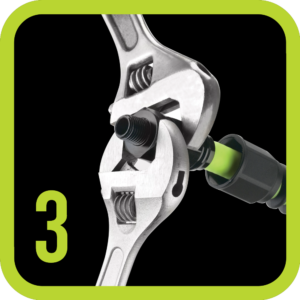 TIGHTEN – Tighten fitting nut until snug. Slide bend restrictor up adn snap onto nut. 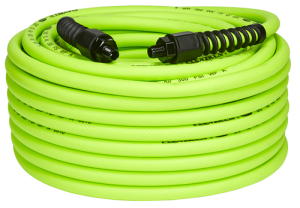 Flexzilla® Pro Air Hose is available in a wide variety of lengths, dimensions and fittings to meet all your needs. 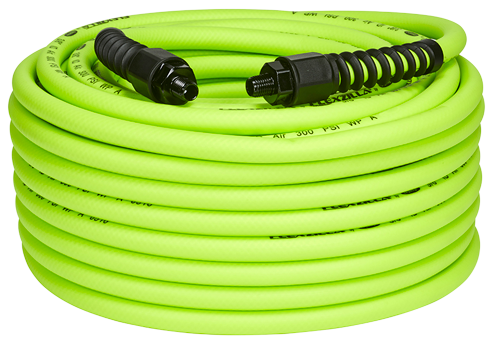 This convenient hose kit features the revolutionary Flexzilla® Pro Flexible Hybrid Polymer air hose paired with a Red Industrial (Type D) ColorConnex® coupler and plug set (one each). 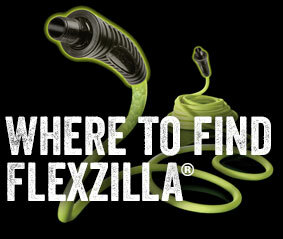 Combining Flexzilla’s revolutionary design and the convenient color coding of ColorConnex, you get two great products in one. Plus, since the thread sealer is already installed on the coupler and plug, you’re ready to go as soon as you reach the job site. 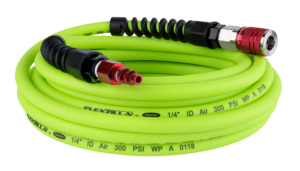 Flexzilla Pro Air Hose Kits are available in a wide variety of lengths, dimensions and fittings to meet all your needs. WARNING: Use only on compressed air lines at a maximum operating pressure of 300 psi. For safety, do not exceed the pressure limitation of the hose and/or air-operated device you are using. This product is not designed for use with fluids, for non-industrial applications, or for life support systems. Failure to follow these directions exactly may result in personal injury or property damage.